Flamingo has quietly introduced a new room type into their lineup. The new FAB rooms will are available for booking starting in 2012. The name goes along with Flamingo's "Forever Fabulous" campaign. The rooms look like an updated version of the basic "Deluxe" rooms. The major differences are the new hardwood floors and pink curtains. I can't tell for sure but it looks like most of the furniture was held over from the old rooms, including the headboards. Pricing will likely depend on popularity, but based on what I'm seeing right now it looks like these will be more expensive than the "Deluxe" rooms, but not as expensive as the popular "GO" rooms. 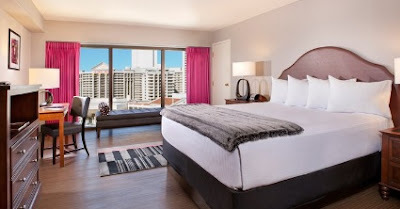 I'm wondering if all of the older rooms at Flamingo will be replaced by FAB rooms eventually. 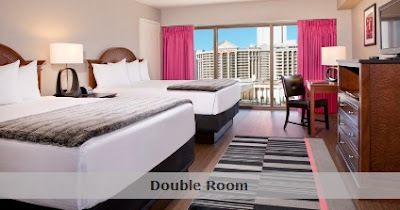 The older rooms at Flamingo could use some refreshing, but I'm not sure if hardwood floors would be a good choice for the majority of rooms.